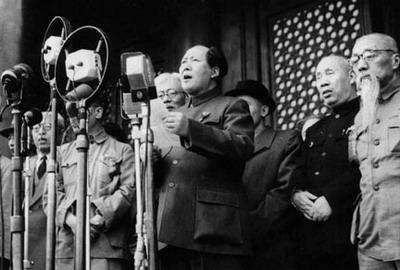 Pictured here is former Chinese Chairman Mao Zedong announcing the founding of the People’s Republic of China on October 1st 1949. Source: sina.com ➚. Available under a Creative Commons license ➚. After one hundred years of turmoil and humiliation in the Opium Wars; Taiping Rebellion; Japanese occupation and Civil War, China has finally ‘stood up’. Mao included this famous phrase in his speech on October 1, 1949 to launch the People's Republic of China. In the 1920s the Chinese Communist party grew in urban centers where people had access to Marxist literature. Mao Zedong joined the party in response to the unfair treatment of China in the Versailles Treaty ➚ after the First World War. Some limited support came from the newly formed Communist Russia. Initially this support was given to both the Communists and Nationalists as they were both grass-roots Republican parties seeking to overthrow dynastic rule, but the nationalists had much greater numbers and a wider power base (see our history of the Republic of China for more info). After Sun Yatsen's death in 1925 the animosity between the two parties grew, with temporary truces to form short-lived 'United Fronts' against the Japanese occupation. During the Japanese occupation Mao with some Russian aid consolidated his support from local rural peasants. In 1944 his guerrilla tactics gained a great deal of Japanese occupied territory, often with the crucial support of rural civilians. By 1945 he was able to capitalize on the Japanese defeat, capturing Manchuria and the weaponry that they left behind. The Civil War with the Nationalists took two hard years to complete but in the end victory was swift as Chiang's army and support melted away. Although the GMD had full American support they were dogged by a reputation for corruption, ruinous inflation and poor political calculation. Chiang Kaishek and 100,000 Nationalist troops fled to Taiwan in April 1950. However in the period 1950 to 1980 the hostile American-backed Taiwan government posed a lingering threat of invasion should the Communist regime falter. In 1949 China was at an all time historic low. 80% of the population of over a billion were illiterate. Teachers, engineers, doctors and skilled labor were in very short supply; for instance there were only fifteen doctors in the whole of the vast province of Xinjiang. Industrial output had been decimated by war. Subsistence agriculture was carried out over much of the country with famine an ever-present fear. In Shanghai it was estimated that 20,000 people died on the streets each year from disease and starvation. Dramatic action was needed to turn things around and the PRC achieved much success in the early years. After the foundation of the People's Republic on 1st October 1949 there followed years of hardship with many millions dying in ill-conceived or over-ambitious reforms. The country was bankrupt; very limited industrial capacity had survived the conflicts. Agricultural output had been decimated with livestock slaughtered for food during the War. The early aim was to maintain China's unity and to bring all Chinese people together again as a nation with a common vision. The support of rural peasant farmers that was crucial in the Civil War against the Nationalists remained Mao's power-base. Life prior to ‘Liberation’ was grim for civilians. Rampant inflation resulted in widespread distrust of money. If a salary was paid in cash, workers would immediately buy food as there was no point in saving it or depositing the money in a bank. The Communist's first task was to control inflation so that people would have trust in the financial system. This they achieved swiftly in the first year or two. Just eight months after the foundation of the People's Republic, China faced a difficult situation on its borders. The Allied World War II leaders (Roosevelt, Churchill, Stalin) had agreed an awkward compromise as to how the conquered Japanese territories would be split up if they won the war. America did not want Korea to fall into Communist Russian or Chinese hands, Russia saw Korea as an extension of their regional interests in Manchuria and had a historical claim on the land. The terrible compromise was to split Korea in two on the 38th parallel of latitude (see our separate section for full details of China's history of relations with Korea). Russia would 'control' the north and America the south. Korea had never been divided like this before, it was a purely arbitrary line imposed on it by hostile powers. This was all the result of the Japanese occupation of Korea in 1875 so its peoples must have felt totally betrayed. When the Communists beat the Nationalists and succeeded in putting Manchuria under Chinese control the politics of the situation became even more perilous. America saw the growth of Communism throughout Asia as a serious threat. China had always seen Korea as a vassal state under strong Chinese influence. So a complex power struggle between China; Russia and the United States was played out in Korea. 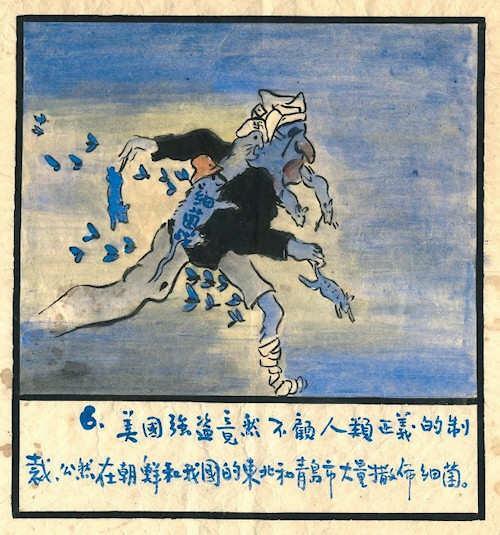 Blue background with a man-like creature covered with rats and flies, which represent biological warfare. Captions condemn the United States for using biological warfare in Northeast China and Korea's disregard of international sanction. Poster by Bu Xiang, 1952? Available by courtesy of the National Library of Medicine under a Creative Commons license ➚. In June 1950 the North Koreans, with the backing of the Russians, invaded the south in an attempt to re-unite the country. American and the UK's Commonwealth troops poured in to defend the south and by October 1950 the south and most of the north of Korea had been re-taken. The border with China on the Yalu River looked threatened and the new Chinese regime feared an attack by the Allied powers on Manchuria. So a counter-attack by Chinese PLA (500,000 strong) was planned in secret and on 26th November 1950 a surprise attack was launched on the unsuspecting U.N. backed troops. By the end of December the Chinese troops had pushed back down to the 38th parallel. The Chinese army was called the 'People's Volunteers' as the Chinese government did not want to be seen as an official protagonist. By January 1951 the Chinese backed army had pressed further south and captured the southern capital Seoul. The American General MacArthur ➚ espoused the wish to escalate the conflict and take on China directly, but President Truman replaced him with General Ridgway ➚ who had a less bellicose position. In April the new Chinese Field Marshal Peng Dehuai ➚ pushed on too far with poorly equipped volunteers and suffered about 50% casualties without moving the front line substantially. In June Russia intervened by suggesting a ceasefire, China and the U.N. agreed to this. In 1952 both sides settled down to attrition from trenches rather than full out conflict in open country. An armistice at Panmunjom ➚ was agreed on 27 July 1953 with the North-South divide restored to the 38th parallel division. About 500,000 people had died in the conflict (including Mao's own son Mao Anying ➚) with 700,000 injured. America now knew it would be impossible to overthrow the Chinese Communist state by conventional warfare, and on the other side the Russian and Chinese communists learned that expansion was going to be opposed by America at every turn. Image shows three young Chinese Red Guards from the Cultural Revolution. 26 December 1971 Photo by Villa Giulia, available under a Creative Commons license ➚. Notice how a 'red pen' is being used as an offensive weapon and the Little Red Books of Mao's thoughts. One of the first steps of the People's Republic was to remove private ownership, so that everything would be held in common for the people. Land reform involved removing, often violently, the landlord class who had exploited peasant families for centuries. The feudal families of landlords owned the land and often lived lavishly on the collected rent and did not need to work themselves. They prospered on the backs of grinding poverty and famine among the peasants. The land reforms brought in the confiscation of property without full compensation by the peasants who had for centuries lived in fear of their over-lords. In economic terms it was the largest land appropriation in history. Co-operatives were then set up so that the land was farmed by the whole community. Initially there were initiatives to open debate about China's future, Mao's 'One Hundred Flowers campaign ➚' was launched in 1957. This was a reference back to ‘One Hundred Schools contend’ movement in the Warring States and Spring and Autumn periods. Social reforms were far-reaching. The marriage law of April 30th 1950 removed the age-old rules of Confucian loyalty within the family and the superiority of men. People were free to relocate around the country and to marry who they wished; many forms of sexual inequality were removed including inheritance by sons only. Schools were established that even the poor could attend. The old methods of learning the classics by rote were gradually replaced with more interactive methods. In the early years reforms were based on the Russian model with Russian help and advice. Ambitious five year plans were instigated to control the development of industry and agriculture. The five year plan 1953-57 was a success with a 14% annual industrial growth rate; but by the end of 1957 the Chinese leadership began to think the rigid Stalinist model was inappropriate for China. A number of mass campaigns were instigated that reinforced the feeling of unity. In 1952 there was a health campaign against the 'Five Poisonous Things' (mosquitoes; flies; rats; body lice and fleas). Everyone was expected to make a contribution; at Yenching University, Beijing the quota was for each person to kill two flies a day; twenty mosquitoes a week and one rat a week. Toilets were covered, rat holes stopped up, bowls of water emptied out, all to reduce the numbers of these pests. Another campaign that exemplified the ‘new thinking’ of the PRC was a ruthless attack on the four olds: ‘old culture, old customs, old habits and old thinking’. Temples and Confucian schools were demolished; Classic books burned. Food and clothing as well as everything else was rationed. One directive that gives a flavor of this time stipulated that a pair of trousers should last nine years: three years worn as new; three years worn as old and three years worn patched. Although success was limited, the main benefit was engendering a community spirit, everyone was expected to make a contribution to help strengthen the new nation of China. There were disputes to settle on the fringes of China. Tibet, considered a part of Qing China, had become independent during the days of the Republic before it was annexed in 1950. Further revolts in Tibet in 1959 were harshly put down. In 1962 a border dispute ➚ with Russian backed India led to a one month war over the ownership of the Aksai Chin and NEFA regions. During the early period under Mao's leadership there were many purges of 'counter-revolutionaries'. The category was a broad one, basically it was considered that anyone who did not wholeheartedly support the Communist reforms was considered an opponent of them and so an 'enemy of the people'. This included not only those who did not back the political message but also criminals. A criminal act was seen as a crime against the people and just as much a counter-revolutionary as those backing capitalism. Among those caught up in these purges were organized crime gangs. Over the centuries triads ➚ and similar secret societies had held power and lay beyond the reach of the law as many had connections with officials administering justice. At the time it was claimed that as many as 2 million people had been killed as 'counter-revolutionaries', this figure is disputed and seems to include many deaths associated with the Civil War with the Nationalists. After the first Five Year Plan (1953-57) had produced limited progress Mao initiated the Great Leap Forward in 1958. The plan was to use mass labor to rapidly kick-start industrial and agricultural development. By hard collective work the vision was that China could over-take European nations and even the United States of America. Mao sought to emulate the great construction projects of the past that built the Great Wall and the Grand Canal. Vast numbers of backyard furnaces were built that produced unusably poor quality iron and steel. Massive agricultural projects were started too, combined with ambitious irrigation schemes. Around 80,000 small scale dams were built and over 3,000 were built so poorly that they had collapsed by 1981. This slogan typifies the spirit of the time ' The bolder a man dares, the richer his land bears' - achieving any target was just a matter of trying that little bit harder. The first signs seemed encouraging but over-ambitious targets and competitive exaggeration led to famine and Mao stepping back from leadership. Natural disasters (floods and droughts) played their part too, but millions died as a consequence of the Great Leap. Under Liu Shaoqi and Deng Xiaoping small scale private enterprise then replaced the huge co-operatives. However an enormous centralized bureaucracy had been created to carry out the reforms and this was to a large extent to blame for the failure. Decision making was slow and the chain of communication too long. Reporting of disasters was suppressed, it was considered deeply unpatriotic to criticize the plan. Among the many initiatives were sessions where individuals were invited to give talks admitting their failings: ‘self criticism sessions’. These were intended to allow people to make contrite confessions. Some used them to launch attacks on their colleagues but in general the best way to avoid censure was to admit to minor selfish actions and ambitions. These sessions were held in large meetings and on occasions an individual was used as a scapegoat for all the organization's failings. An individual had no right to appeal and could lose their job and on occasions their life. When the Communist party came to power they knew that control of the media was needed if their message was to be taken up by the people. Soon the 'Western style' newspapers featuring gossip, fashion, sport and entertainment disappeared. During Mao's era the newspapers became bland purveyors of facts. Production figures, legal changes, agricultural innovations and initiatives filled the pages. To understand policy it was necessary to read the papers carefully. Most citizens knew this was propaganda and learned how to read between the lines. Another propaganda tool was the holding of large exhibitions, particularly the Canton fair ➚. These drew huge crowds from all across China. The latest agricultural and industrial achievements were shown off so other groups could go back and copy the improved methods. Other initiatives sought to improve the level of literacy, many poor people unable to read or write were able to attend and study for the first time. Support from Stalin's Communist USSR initially aided China’s rapid military and industrial development. At first this help was very much welcomed because unlike ‘foreign’ support from America, Britain and Germany the Russians did not seek to gain financially from it. Eventually, however, the Sino-Soviet split ➚ in the late 1950s/ early 1960s left China alone, virtually closing up its borders for the next twenty years. China felt enclosed by Russia: India, Vietnam, Afghanistan and Korea who were all at some time allies of the USSR; Russia must have thought it would be easy to bring back China into its fold of Communist nations. A border dispute with Russia in 1969 on the Ussuri River ➚ almost led to full scale war. China had to fight proxy wars with the United States in Korea (1951) and with Russia in Vietnam (1979) before China emerged strong enough to be respected as an independent nation and world power again. The explosion of the first Chinese atom bomb ➚ on October 16th 1964 (from a project begun with Russian technical help) marked China's admission into a very select group of nuclear defended nations. During the 1960s Mao became convinced that reform of the P.R.C. was stalling and that the traditional bad old capitalist ways were returning. Following the tenet that Marxism required continuous revolution ➚, he unleashed the Cultural Revolution (文化大革命 Wén huà dà gé mìng) in 1966 and was propelled back to power with the fanatical support of students and ordinary workers. The Red Guard movement (红卫兵 hóng wèi bīng) was born. 11 million Red Guards flooded into Beijing from all over the country. Buildings were renamed with ‘Red’ in their name, it was suggested that Beijing should be renamed Hongjing ‘Red Capital’. Egalitarianism reached an extreme at this time all workers in urban areas, no matter how skilled, received the same basic pay. The movement was really only an urban movement, rural areas were little affected. A guiding philosophy was to reject all old and traditional thinking, everything had to be new and based on Mao’s brand of communism. In Beijing 72% of the cataloged relics were smashed to dust and 37% historic sites flattened. It was dangerous to know about or like anything ‘foreign’ or ‘old’. Students took over teaching at universities and nurses took over operating theaters. Western orchestras were disbanded and the musicians sent to the countryside for manual labor together with many ‘educated’ young people. As well as keeping discontented people away from the cities, the displaced people would learn at first hand the unending life of monotonous toil endured by the rural masses. Many millions were accused of ‘counter-revolution’ and suffered; it took years for the fervor to die down with the assistance of the Army. CCP leaders were tortured, imprisoned and some killed, including most notably Liu Shaoqi but also Bo Yibo ➚. All new printed books had to be supportive of Mao, often with a preface extolling his virtues. The ending of the cultural revolution was a gradual process, manual labor was still more highly valued than intellectual achievements; even at Universities students spent time as farm laborers as part of their courses. During this period men and women wore the same uniform - simple blue jackets with pockets often called ‘Mao suits’ but in fact it was Sun Yatsen who brought in this style. It was the Nixon visit in 1972 that marked a sea change, China then became no longer isolated and gradually opened up its borders. China had been under threat of Russian invasion for many years, by healing relations with the United States, China was able to engage in subtle diplomacy between the two world super powers. 1976 was a tumultuous year in China. Not only did three major political leaders die: Zhou Enlai (8th Jan); Zhu De (6th July) and Mao Zedong (9th September) but a major earthquake hit Tangshan on 29th July killing about 400,000 people. For thousands of years major disasters were taken to signal the end of a dynasty's right to rule (the Mandate of Heaven) and in this case 1976 marked the end of the Cultural Revolution. Public sentiment against the current leaders was expressed on the death of Zhou Enlai, two million people came to mourn his death in Tiananmen Square (the Tiananmen Square Incident) and the leadership cracked down cruelly upon them because Zhou Enlai and Deng Xiaoping were out of official favor. Jiang Qing and Mao Zedong. Source : Netor.com ➚. Available under a Creative Commons license ➚. 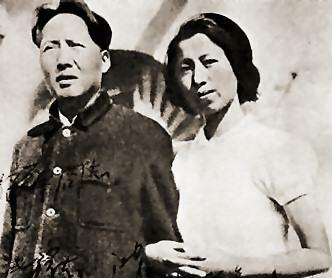 Mao's fourth wife Jiang Qing was considered the leader of the left wing faction known as the ‘Gang of Four’ (G4) which was prominent in the 1970s. They opposed the market led reforms of Zhou Enlai and Deng Xiaoping. They were broadly anti-intellectual, labeling them as the ‘stinking ninth category’ and promoted the workers above all others. Jiang Qing was a former film star and produced many revolutionary operas during the Cultural Revolution. The other members making up the 'four' were Yao Wenyuan ➚, Zhang Chunqiao ➚ and Wang Hongwen ➚ (an ex worker from a Shanghai factory). All four were members of the ruling Politburo and had great influence during the Cultural Revolution. Mao broke off with the heir apparent Lin Biao in 1970 when he made comments about Jiang Qing and criticized the Cultural Revolution. A show of mass public respect for Zhou on his death on 4th April 1976 was a key indicator that public sentiment had swung against the Cultural Revolution and the ‘G4’. Many people may forget that Chairman Mao did not lead China from 1949 until his death in 1976. In fact Mao gave up the leadership of China to his then trusted Vice Chairman Liu Shaoqi 1959-68. It was when Mao saw Liu and Deng moving China towards a market ecomony that Mao steped in and imposed hard-line Communism. Liu Shaoqi died in miserable circumstances under house arrest. On 21st October 1976 a month after Mao's death the Gang of Four were arrested and put on trial by the new leader Hua Guofeng. Their fall marked a decisive turn away from the madness of the Cultural Revolution. To blame Mao for the horrors of the last dozen years would have weakened the grip of the Communist regime's power, so it was necessary to find other culprits who had 'sabotaged' the initiatives. In late 1980 the ‘show trial’ of the Gang took place exposing the worst excesses of the Cultural Revolution and the four were condemned as scapegoats for its failings. They were blamed for Liu Shaoqi's death and plotting to take power. They were all found guilty. Jiang and Zhang were sentenced to death but they were spared and given life imprisonment, Yao and Wang both received long prison sentences. Jiang developed throat cancer in prison and on release to hospital committed suicide on May 14th 1991 still blaming Deng and praising Mao. Mao's vision of the P.R.C. was carried forward by Chairman Hua Guofeng although the harsher aspects were relaxed. Major reforms continued including the 'One Child Policy' (1979) that followed alarm at China's rapidly increasing population and therefore pressure on food supply. Life expectancy had dramatically improved due to the availability of western healthcare. Although millions died in the early years of Communist reforms, the population as a whole had increased substantially. Agricultural reforms began to add more open market opportunities for family based farms. Deng Xiaoping then came back to power and chose a new market-led policy and won the battle to lead China in 1981. He dismissed the system of agricultural co-operatives as too ambitious, an attempt to 'reach heaven in one step'. Educational reforms re-introduced the importance of examinations and qualifications. Economic growth was particularly strong in Guangdong with access to the money and expertise of the people of adjacent Hong Kong. Special Economic Zones such as nearby Shenzhen were established and then grew very rapidly. The 'Tiananmen Square' incident in 1989 revealed the limits of tolerance for democratic reform. Student protests over corruption and pace of reform just as much as about democracy were ruthlessly put down. The leadership had a legitimate fear that the protest might reignite the ten year madness of the Cultural Revolution. The state suppression of free expression has continued unabated. In the 1990s the break-up of the USSR resulted in the easing of tensions with Russia. Deng's nominated successor Jiang Zemin continued the rapid economic development of China. Gradual reform has taken place at all levels, however all power still lies in the Standing Committee of the Politburo. Hu Jintao took over from 2003 and has witnessed tremendous economic growth and change. The smooth transition to the leadership of Xi Jinping in 2013 has given a feeling of confident continuity. Most Chinese people will now say that their country is the biggest capitalist nation in the world with a rapacious appetite for making money. The position of a Communist leadership that was originally the avowed enemy of capitalism seems to be, at best, anachronistic. It is only as the representative of the rural poor that the party can claim to ameliorate the worst excesses of a headlong dash into money making. Whole city view of Shenzhen, Guangdong. 5 November 2012 Photo by Xublake, available under a Creative Commons license ➚. Shenzhen was the first Special Economic Zones (SEZ) in Deng's economic reform program. A portrait of Karl Marx before 1875. International Institute of Social History in Amsterdam, Netherlands Photo by inconnu, available under a Creative Commons license ➚. China is still officially a Communist state and yet has a rapidly developing capitalist economy. To figure out how this contradiction has come about it is necessary to look back into recent and not so recent Chinese history. When most people think of Communism they think of dictatorships and poverty. This is very far from what Communism was supposed to be and a poor starting point when trying to understand the Chinese brand of Communism. When the USA was full of rabid anti-communism ➚ in the mid twentieth century it became difficult to consider Communism fairly, soldiers had given their lives trying to stop this apparent evil from infecting the world. To comprehend the situation in China requires reappraising long held views. The origin of Communism came from the Industrial Revolution. Millions of people in Europe became the slaves of the companies running the new factories. People lived in squalor and had no rights while the factory owners became fabulously rich. Karl Marx analyzed the situation and proposed a new, fairer structure of society. To transform a country to his view of Utopia he set out a multi-stage strategy ➚. One of the tragedies of Communism is that the first stage of transformation was to impose central, authoritarian control so that the new ‘equitable’ structure could be put in place. Unfortunately very few Communist regimes moved on to the next stage of devolving power back to the people. Once in control communists found it impossible to voluntarily give up their dictatorial power. A central tenet of communism is that personal ownership should be removed (‘property is theft ➚’). No-one owns anything, everything is held in common for the use of those who need it. This has great appeal to situations where the mass of people are living in poverty and have no possessions to lose. In the communist ideal, if you want something : a new coat, a car, a hammer you go to the community leaders and put your case to ‘borrow’ the item for a while. Just as importantly the community provides health care, child care and a pension. The communist system was intended to provide ‘cradle to grave’ security for everybody. Equal rights for women and the suppression of religious control were other widely appreciated aims of communism. 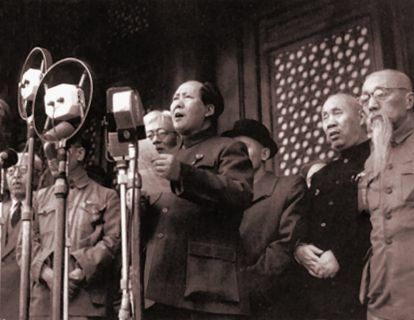 Mao Tse-Tung, leader of China’s Communists, addresses some of his followers. 6 December 1944 . Photo from Franklin Delano Roosevelt Library, available under a Creative Commons license ➚. Revolution in China has deep historical foundations. As far back as the Han dynasty the peasant led Red Eyebrow Rebellion movement fought to overthrow the unpopular government of Wang Mang. Even before that it was well established that an Emperor ruled subject to the ‘Mandate of Heaven’. When it was clear that he had lost the mandate, revolution was the correct course. Mao echoed this years later with the maxim ‘to rebel is justified ➚ Zao fan you li 造反有理’. However most dynasties rose and fell due to strife within the ruling elite, not from the mass of poor peasants. The Taiping Rebellion came close to toppling the hated Qing dynasty, and was a peasant led uprising with many egalitarian principles. The lesson of the Taiping Rebellion was not lost on the Chinese Communists, it showed how popular mass support could be mobilized. Communism came to China at the end of the 19th century when China was at its lowest point. Marx and Engels had depicted China as ‘an embalmed mummy at the end of the world’. Many shared their analysis that China was ripe for revolution. Communism in China has to be viewed as a special case. Comintern ➚, the organization responsible for promulgating the Communist creed around the World was set up to lead countries on the road to revolution and the installation of Communist governments in each and every country. It was the ambition to violently impose Communism throughout the World that made the philosophy so toxic. The USSR as the first and leading communist state controlled Comintern. In China in the period 1920-45, both the Republican movement and the Communists both sought and received help from Comintern. Russian agents such as Mikhail Borodin ➚ visited China to supervise the creation of underground political organizations. Future Chinese leaders including Deng Xiaoping and Chiang Kaishek visited Europe and Russia to see communism in action at first hand. However attempts by Sun Yatsen and others to start revolution failed in the cities. The failure was, to a great extent, due to the special situation of China. Marxist thought and revolution were aimed at nations that were already industrialized, China at the time was principally agrarian. Mikhail Borodin came to the view that a Communist revolution was too hard a task at the time. The warlord era had brought in military 'gangsters' who were only interested in rifles not ideology; the Communist party at the time was too small and weak. It was Chairman Mao's insight that for communism to succeed it needed to be solidly backed by the majority of people in the countryside. The bulk of Chinese population constituted the poverty stricken peasants slaving in the fields. With widespread grassroots support the revolution could spread to the new factories where relatively few Chinese people worked. Mao's brand of Marxist-Leninist thought emphasized the power of the people; who once motivated could achieve almost anything. He spoke in 1945 about the ‘Foolish Old Man who Removes the Mountains ➚’ an ancient tale of how dogged determination over long periods could level evan a mountain. The rural people had no belongings, scratching a poor living on a tiny personal plot of land rented at a high cost from a landlord. The benefit of pooling land ownership to the village and then to groups of villages had obvious and huge benefits. The commune could jointly buy the machinery and fertilizers to vastly increase the yield from the land, far beyond the ambitions of the farmers on their own. Pooling manpower enabled irrigation and other large scale land improvements to be carried out. To achieve this end, the hated landlord class had to be swept aside and land ownership passed back to peasants. The success of many of these Communist reforms in the 1950s led to widespread fervent support. Many Chinese had suffered in the Japanese Occupation and the Civil War, a stable government supplying adequate food and a stable financial system was a welcome change. With such an attitude you can see why a ruling elite would be fearful of a communist revolution. Many people think that a communism system is a negation of democracy. This is not the case. When China became communist it became far more democratic. Important decisions were no longer made by managers but by a committee elected by ordinary workers. However, there was only one political party and when it decided a policy that was it, there was no room for disagreement. In the 1950s workplace discussions, elections and meetings took a substantial part of the working week. All idea of an elite management group making all the decisions was untenable at this time. China took the philosophic route of rule by individuals (hopefully benign) (人治 rén zhì) rather than the Western model of rule by law (法治 fǎ zhì). The Communist victory in 1949 was brought about by the support of the rural peasants who were promised land reform. The hated landlord class was soon swept aside and the land ownership given to the peasants who farmed the land. However this was just the first stage in land reform, over the centuries land had become split into tiny plots, often just large enough to provide sufficient food for a peasant's immediate family. The land was farmed by hand and for long periods of time in the winter there was often no work to do. It was obvious that joint enterprises would reap huge benefits. Local joint projects for irrigation, afforestation, land reclamation became practical by working as teams. By 1955 these small co-operatives enabled crops to be planted and harvested by many more laborers more quickly and efficiently. By the end of 1957 97% of peasants had pooled their land into 'advanced' co-operatives. However, ambitious plans in 1958 needed greater man power to build the planned infrastructure of dams, canals and roads needed to really revolutionize agriculture. Suiping County ➚, Henan became the much vaunted example of a 'super' co-operative - the first proper commune in April 1958. The existing co-operatives merged to form the Chaya Weixing People's Commune of 40,000 people. The move to follow this example became a craze and by the end of 1958 most co-operatives had merged to form these large communes. However a 'commune' was usually not a new entity, it was based on an existing district or county that had collectively moved to the new system. It used existing buildings and administrative structures but followed the new communist philosophy. The communes were organized as a set of production brigades - one brigade from each village. The commune system ➚ soon ran into trouble, they had been set up too quickly with no centralized planning. Too many people moved from farming to engineering and so livestock rearing was neglected. The perceived benefits of pooling ownership led to ever larger communes comprising thousands of people. Without a functioning rail and road infrastructure shortages and surpluses could not be put right. The faulty logic was that economies of scale could continue to be applied to bigger and bigger collectives. Schools and hospitals were built to serve the whole commune. Joint effort extended to catering, everyone ate at a communal hall, families did not even have to worry about buying and cooking food. The ample supply of food was the most important development because for thirty years or more peasants had known famine and starvation at first hand; a system providing a reliable supply of free food was the first, much appreciated priority. The control of the commune expanded to even decide who could marry who and when children should be conceived. They were ran by a few party officials who lacked the experience of running huge enterprises. An individual's knowledge and expertise was never fully utilized in a system where all workers were treated exactly the same. It was widely reported in America that the commune system was some evil system imposed by a dictatorial government which split up families and put people into slave labor. This was the era of rabid anti-communism and as China was closed to Western journalists it was easy for these false reports to go unchallenged. The few Westerners who were allowed in saw no evidence of imposition of the communes, just widespread enthusiastic, perhaps over-zealous, voluntary action. In most cases whole families moved into them, they were not split up. Kindergartens were set up for the first time as women went out to work with the men, but the choice was voluntary. It is true that family life changed, but only in the positive sense that women were given equal rights to men and were no longer shackled to their husband's every whim. The philosophical basis of communism only works when people are committed to work together for the common good. The system takes away the individual aspiration to support oneself and immediate family. With little personal incentive to work hard and innovate, it becomes all too easy for some people to do the minimum work necessary; all the family's needs will be cared for by the Commune however hard you work. Quotas for agricultural and industrial output were set centrally, there was little incentive to exceed these quotas. In the case of China the ‘common good’ was to found a modern, strong nation and this nationalistic aspiration was more important than the Marxist-Leninist message. At the opposite end of the spectrum from the marginalization of individualism was the proselytizing zeal of the party cadres. By careful education, a new breed of the blinkered communist recruits sprang up who believed totally in the Communist system. Such un-questioning zeal brought selfless enthusiasm and energy to the reforms. Many communes became locked in a competition to who could achieve most reform in the shortest time. Some descended into the delusion that communism could achieve the impossible. Unrealistic targets were set, and communes inflated their figures to appear to meet them, as they could not be seen as lacking in commitment. The planners in Beijing ended up with useless statistics on what had been achieved and so were unable to plan ahead. Shortages; famine and starvation resulted mainly from the reluctance to admit to failure. The story of Communism to China needs to look at the wider position at the time. The split between Russia and China in the late 1950s had far-reaching effects to the whole World and to understand the split requires taking a world view. Russia's revolution in 1917 was fueled by the discontent of troops and industrial workers. At the time it was fighting in the First World War with the UK and France as allies. It was more of a coup d'état than a revolution. In World War II Russia was again the ally of the Western powers and even received aid from America. Russia had a permanent seat on the United Nations security council. Trotsky ➚'s vision of spreading revolution worldwide had lost out to Stalin's vision of Russian control. At the end of the war Russia annexed the Eastern bloc countries by military invasion not by internal revolution. The situation in China was very different, the revolution grew out of a hard won Civil War with little outside help and in the countryside not the cities. China for centuries had been ruled as a homogenous mass of rural villages without a middle class and a hierarchical power pyramid. It was therefore hard for China to accept Russia's dominance as the leader of the Communist world. Doctrinal and personal issues emerged when Stalin was succeeded by Khrushchev ➚. Khrushchev repudiated Stalin's leadership cult and his actions, this tacitly also criticized Mao's own burgeoning personality cult. In 1957 Russia launched the first ICBM ➚ (Inter Continental Ballistic Missile) and the first satellite (Sputnik ➚) shaking America's belief in technological pre-eminence. Mao asserted ➚ that the East was now ahead of the West in his maxim 'the East Wind is prevailing over the West Wind'. Mao's view was that capitalism/imperialism could not peacefully co-exist with Communism, one or the other must take over the whole World. Mao believed Communism should be exported to the developing World (Africa and Middle East) by supporting guerrilla warfare. Khrushchev took a more laid back approach, he did not see why Russia and America could not co-exist; each with their own systems of government. The Korean War highlighted the differences between the two positions, Russia had supported and planned the invasion of South Korea by the North, but when America and the UN drove them back it was left to the Chinese to take them on. In the disputes with Chiang Kaishek's Taiwan regime Russia did not fully support China even though America threatened nuclear war if China fired on the disputed Matsu islands ➚ - China did not have nuclear weapons at the time. When Russia blocked moves for a certain degree of local autonomy in Communist Hungary ➚; Albania and Yugoslavia ➚, Mao was convinced that Russia would treat China in the same way - as a satellite nation under Russian 'imperialist' control. In the Sino-Soviet split the funding and support by Russian engineers and scientists was quickly withdrawn, China was on its own in a much more hostile World. Soon enough Russia built up military posts along China's borders in Mongolia and Vietnam, and proxy wars in India and Indo-China had the two great Communist powers vying for dominance. The pivotal moment came when China exploded her first nuclear bomb ➚ in 1964, China could no longer be considered a second tier country. The nuclear development project, initiated by Russian scientists, had been successfully continued by the Chinese. The American calculation that the Chinese system, left in cold isolation, would soon collapse to be replaced by Chiang Kaishek's pro-American regime began to be seen as ill founded. Western reports of widespread starvation in the 1960s were exaggerated in the hope that the apparent failure of the Communist regime in China would pave the way for internal revolt and overthrow. This was Chiang Kaishek and his American backer's expectation. XVII Congress CPC - The Communist Party of China. Photo by H47H, available under a Creative Commons license ➚. It was Deng Xiaoping's reforms ➚ that started the dismantling of state control and the system of huge communes. Enterprising individuals could earn a little more by growing their own crops in their spare time from communal work. The reforms were popular and state controls and monopolies have continued to be relaxed to the present day. Nowadays the 'cradle to grave ➚' state system only exists for poor people in rural areas, the many that migrate to the cities must sink or swim entirely by their own efforts. Centralized planning is restricted to national initiatives and large infrastructure projects, it no longer controls development in individual cities. Although it is difficult to accept that China is ‘Communist’ in the Marxist sense it can claim to have adapted Communism to Chinese needs, it is an evolution that continues to change as it faces new challenges. The relationship of citizen to state is different to many democracies. Where democracies see ‘rights’ the Chinese see ‘responsibilities’. These can boil down to the same thing, a right to health-care can be seen both as an individual right and also as a general responsibility to look after everybody’s health. This attitude pre-dates the Communist government as it has its roots in Confucianism. At present there does not seem to be any widespread rejection of the current political system, it is seen as a compromise that is in continuous need for reform and remains decidedly Chinese. Citation information for this page : Chinasage, 'People's Republic of China 1949 to the present day', last updated 24 Nov 2016, Web, http://www.chinasage.info/peoplesrepublic.htm.